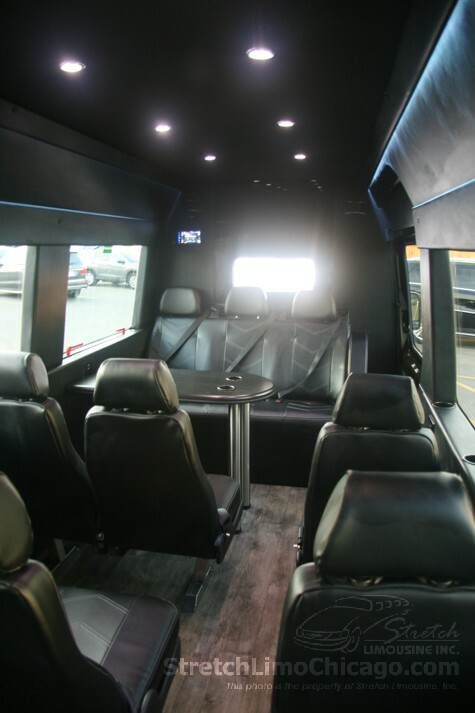 A technologically advanced, safe, reliable, spacious and stylish Executive Mercedes Van combined with luxury and custom touch followed by on board entertainment system is sure to deliver a unique, one of a kind pleasant travel experience you would not want to miss when planning your next trip with friends, family or business parters. 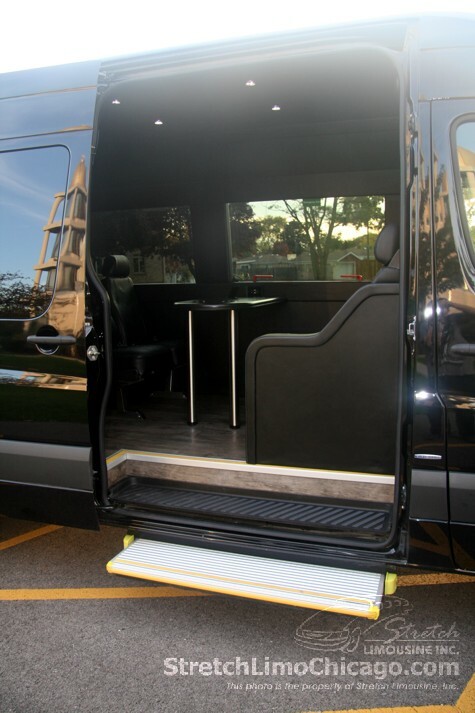 Automatic power step, rear storage area, 70" floor width, interior height of 6'3", 110V power inverter, USB power adapters, leatherette seats with generous leg room, individual head rests and a lounge area with a custom table and a smart HD screen make this vehicle the ultimate Executive style transportation machine. or to reserve this Mercedes Sprinter executive van! Back to front inside view. Front to back interior view. Useful table in case you need to catch up with some work while you travel. 110V and USB power outlets equipped. Open trunk / luggage space. 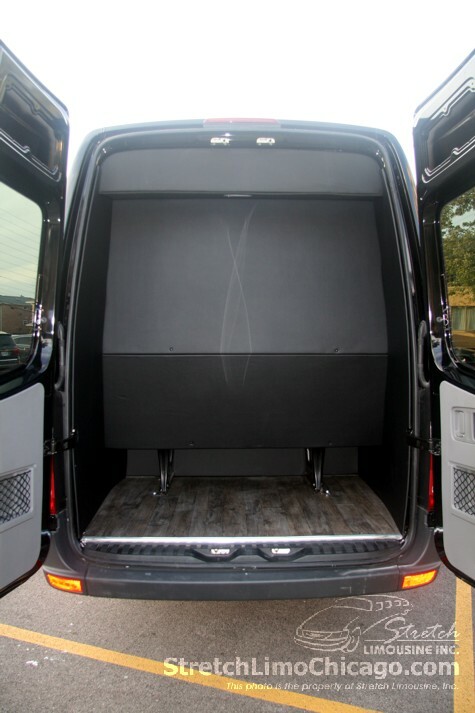 13-passenger Mercedes Sprinter executive style van with open passenger door. Call 866-425-0976 toll free for this Mercedes Sprinter executive van rental availability! 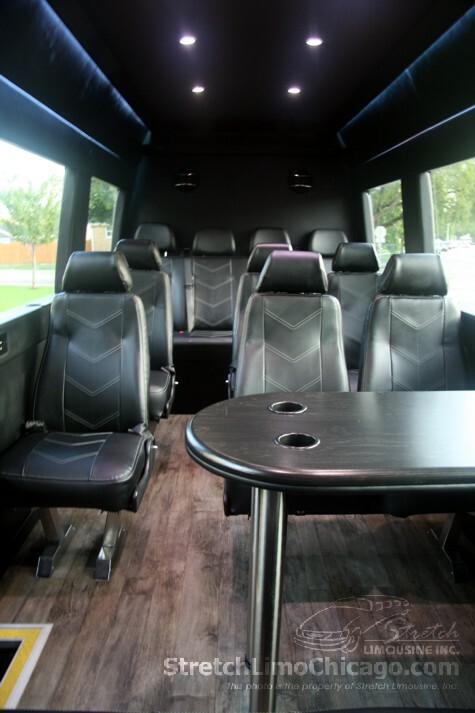 Please refer to the rate table below the hourly rates of our Mercedes Sprinter executive vans. Rates depend on the number of hours and day of the week. 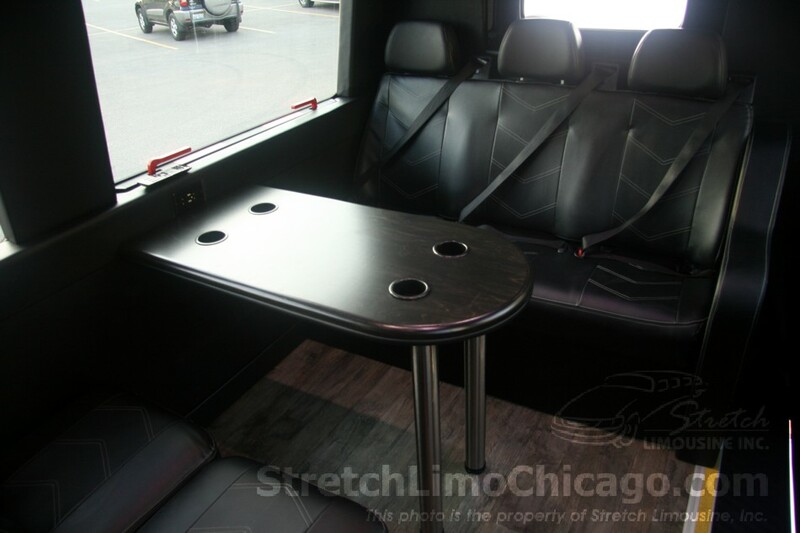 We do not collect sales tax; however, standard gratuity, fuel surcharge and airport tax if applicable will be added on top of our Chicago van rates. 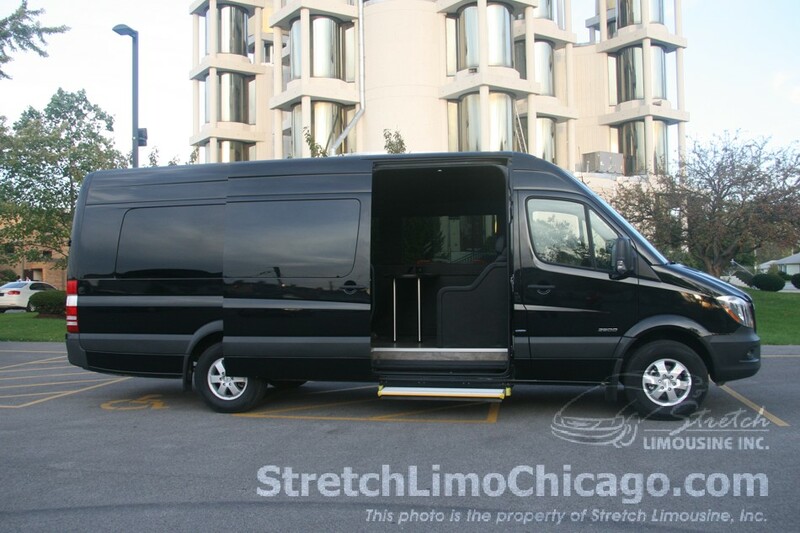 Non-refundable deposit is required to hold a reservation of our Mercedes Chicago vans. 20% standard gratuity and hourly fuel surcharge are additional and will be added on TOP of our Mercedes Sprinter Executive Van rates. Non-refundable deposit specified above is required to reserve any vehicle and take it off the market. Local rates above are valid for pick-ups within the 35 mile radius from Chicago O'hare airport or downtown Chicago. 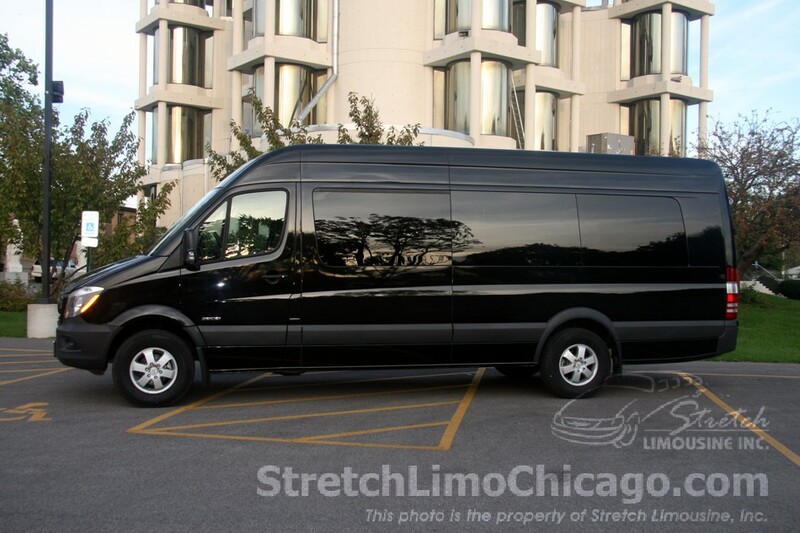 Call 866-425-0976 toll free for this Chicago executive van rental availability ! Please call our office or submit our the free quote request online for pick-up and drop rates or visit Airport Service page for Sprinter Van airport rates. Thank you for visiting our Mercedes Sprinter van page!